Indeed, this volume reveals the diversity of goals, contexts, and accomplishments in the study of nature during the Middle Ages. Synthesizing a vast array of sources, these essays cover topics such as Islamic culture and the natural sciences (F. Jamil Ragep), including mathematics (J.L. Berggren, Elaheh Kheirandish), astronomy (Robert G. Morrison), and medicine (Emillie Savage-Smith); science in Jewish communities of the medieval period (Y. Tzvi Langermann), and the Byzantine Empire (Anne Tihon); cathedral schools and universities (Michael H. Shank) and its organized curriculum (Joan Cadden). Midway in the volume Lindberg (“Science and the Medieval Church”) instructs us that “in the long relationship between Christianity and the natural sciences, the medieval chapter is one in which (contrary to the old stereotype of bloody suppression) Christianity and the classical tradition made peace.” There follows essays on natural knowledge in the early Middle Ages (Stephen C. McCluskey), including cosmology, astronomy, and mathematics (Bruce S. Eastwood), medicine (Vivian Nutton), the translation and transmission of Greek and Islamic science to Latin Christendom (Charles Burnett) and the twelfth-century renaissance (Burnett). There are also entire chapters devoted to medieval alchemy (William R. Newman), change and motion (Walter Roy Laird), cosmology (Edward Grant), astronomy and astrology (John North), light and color (Lindberg and Katherine H. Tachau), mathematics (A. George Molland), logic (E. Jennifer Ashworth), geography (David Woodward), natural history (Karen Meier Reeds and Tomomi Kinukawa), anatomy, physiology, and medical theory (Danielle Jacquart), medical practice (Katherine Park) and technology (George Ovitt). 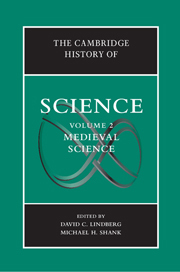 Organized by topic and culture, Medieval Science offers the most comprehensive and up-to-date history of medieval science currently available. The volume is divided into four parts. 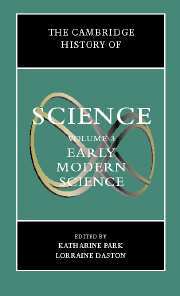 Part 1, “The New Nature,” “address shifts in the foundations and sources of natural knowledge as well as in its characteristic forms of explanation and proof,” and includes essays on physics and foundations (Daniel Garber), scientific explanation from formal causes to laws of nature (Lynn S. Joy), meanings of experience (Peter Dear) and proof and persuasion (R.W. Serjeantson). Part II, “Personae and Sites of Natural Knowledge,” deals with what David N. Livingstone has termed “geographies of scientific knowledge and practice.” Here we find essays on the man of science (Steven Shapin) and women of natural knowledge (Londa Schiebinger); sites of scientific knowledge such as markets, piazzas, and villages (William Eamon), homes and households (Alix Cooper), libraries and lecture halls (Anthony Grafton), courts and academies (Bruce T. Moran), anatomy theaters, bontanical gardens, and natural history collections (Paula Findlen), laboratories (Pamela H. Smith), military and technology (Kelly DeVries), coffeehouses and print shops (Adrian Johns), and networks of travel, correspondence, and exchange (Steven J. Harris). Whereas Part II covers personae and sites of science, Part III offers readers disciplines of science. “Dividing the study of nature” into natural philosophy (Ann Blair) and natural history (Paula Findlen), medicine (Harold J. Cook), cosmology (Klaus A. Vogel and Alisha Rankin), alchemy and “chymistry” (William R. Newman), magic (Brian P. Copenhaver), astrology (H. Darrel Rutkin), astronomy (William Donahue), acoustics and optics (Paolo Mancosu), mechanics (Domenico Bertoloni Meli) and the mechanical arts (Jim Bennett), and pure mathematics (Kirsti Andersen and Henk J.M. Bos), the aim of these chapters is to “acquaint readers with the substantive changes that occurred in natural knowledge”; however, it is noted that “neither all of the chapter headings nor their arrangement would have been recognizable to early modern Europeans, even those most abreast of new developments,” for these were not disparate and specialized areas of research—like much of today’s science—but “crosshatched and complex.” Astronomy and astrology (including optics, acoustics, music, mechanics, and parts of the mechanical arts) were, for example, frequently pursued by the same mind, as were medicine and natural history. It wasn’t until much later, late in the nineteenth and early twentieth centuries, that the sciences were specialized and categorized into disparate—some dropping from the definition of “science” altogether—fields of inquiry. The chapters in Part IV, “The cultural meanings of natural knowledge,” “describe how natural knowledge interacted with the symbols, values, and imaginary of early modern Europe.” A compelling essay on religion (Rivka Feldhay) argues that “neither simple notions of conflict or separation nor general invocation of ‘interaction’ are powerful enough to capture the subtlety and complexity of the transformation of early modern European culture.” Also included in this final part are essays on literature (Mary Baine Campell), art (Carmen Niekrasz and Cluadia Swan), gender (Dorinda Outram), and European expansion and self-definition (Klaus A. Vogel and Alisha Rankin). …The pessimistic conclusion that might be drawn from this account of the tenacity of the Scientific Revolution in the historiography of science is that it will last as long as the myth of modernity, of which it is part and parcel. But modernity itself has a history, myths and all. [There is a lingering image]…that emphasizes the enormous cultural difference between the elegantly clothed and technologically advanced Europeans and the culturally back-ward Americans, in a timeless rural landscape…[evoking] simultaneously the primitive inhabitants of the ‘New’ World and…Europe’s own primitive past. This is the early modern period’s own myth of modernity—one at least as spellbinding as that created for it by latter-day historians.